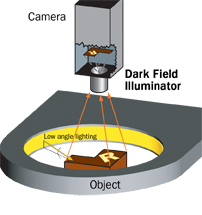 Dark field illuminators provide effective low-angle lighting to targeted regions. 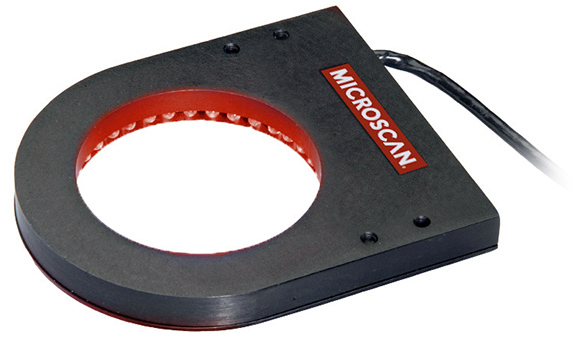 These machine vision lights enhance the contrast of surface features such as laser embossed or engraved marks or surface defects, and are particularly suited for applications such as BGA ball placement, reading laser-etched symbologies and inspecting surfaces with geometric contours. Dark field illuminators use either a single tier of LEDs mounted at either 70º (DF 50 models) or 90º (DF 100, DF 150-1 models) to the optical axis, or three tiers of LEDs mounted at 75º to the optical axis (DF 150-3 models).